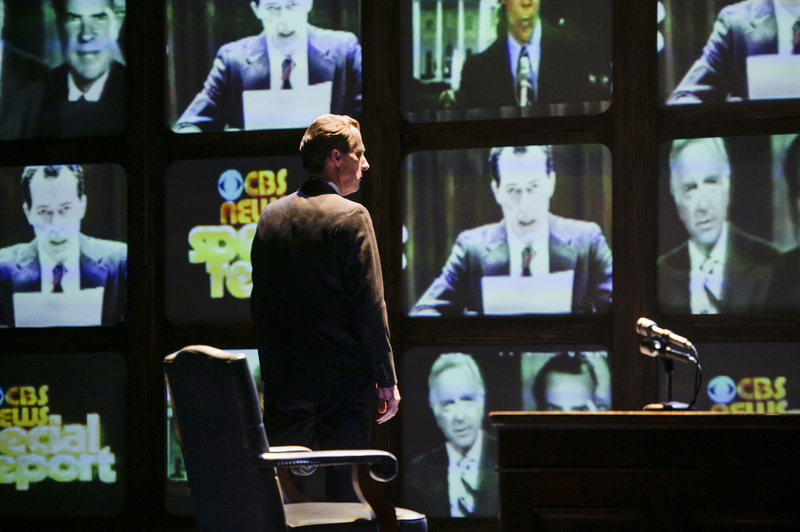 After his televised resignation, Richard Nixon (Allen McCullough) reflects on his presidency in "Frost/Nixon," presented by TheatreWorks Silicon Valley at the Mountain View Center for the Performing Arts January 16 through February 10. 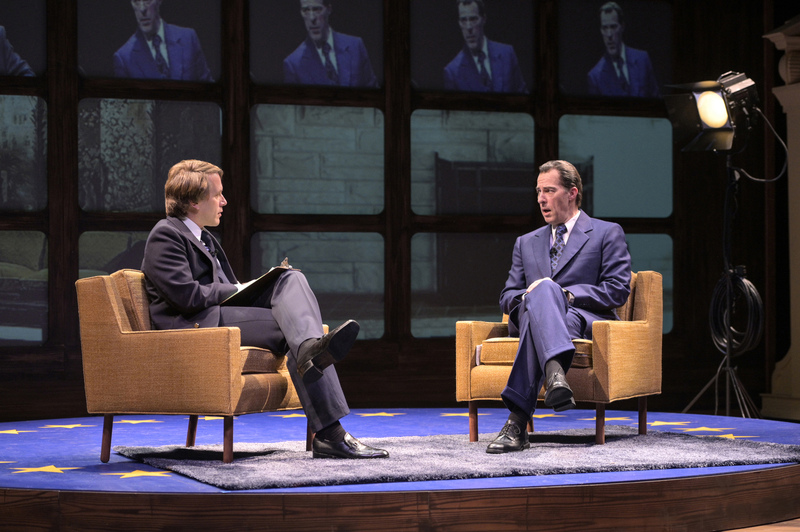 (l to r): David Frost (Jeremy Webb) interviews Richard Nixon (Allen McCullough) about his presidency in "Frost/Nixon," presented by TheatreWorks Silicon Valley at the Mountain View Center for the Performing Arts January 16 through February 10. 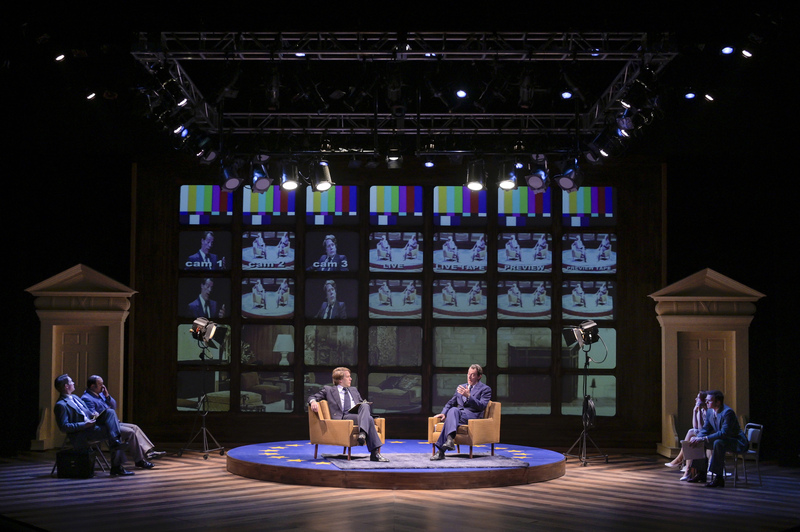 (Center l to r): Talk show host David Frost (Jeremy Webb) interviews Richard Nixon (Allen McCullough) as their teams (background l to r: Craig Marker, Adam J. Saucedo, Elena Wright, and Adam Shonkwiler) watch offscreen in "Frost/Nixon," presented by TheatreWorks Silicon Valley at the Mountain View Center for the Performing Arts January 16 through February 10. 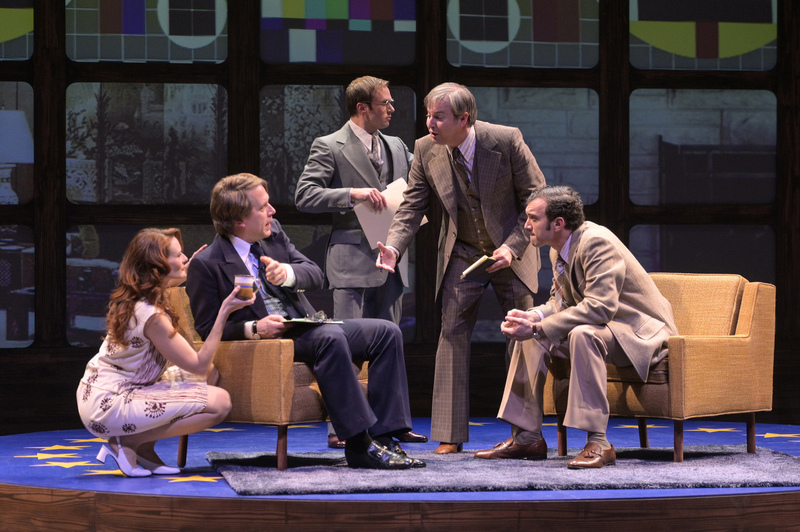 (l to r): Caroline Cushing (Elena Wright), David Frost (Jeremy Webb), John Birt (Adam Shonkwiler), Bob Zelnick (Stephen Muterspaugh), and Jim Reston (Kenny Toll) debrief after the first session of interviews in "Frost/Nixon," presented by TheatreWorks Silicon Valley at the Mountain View Center for the Performing Arts January 16 through February 10. 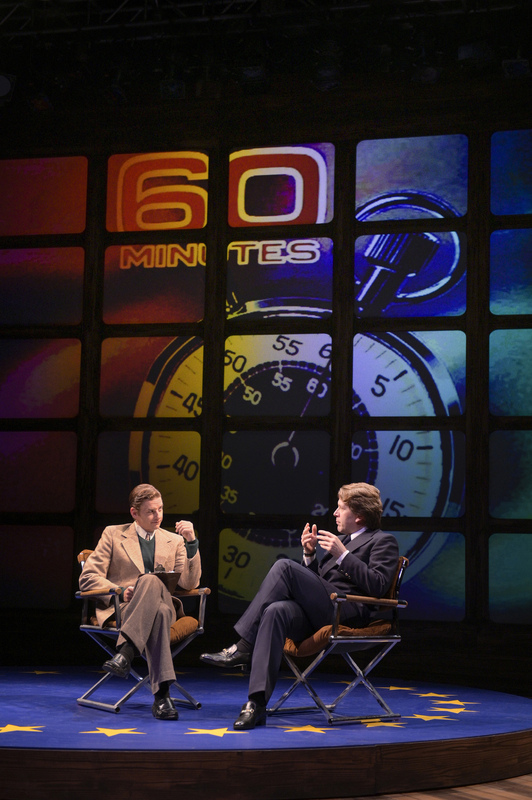 (l to r): Mike Wallace (Patrick Russell) questions David Frost (Jeremy Webb) about his upcoming interviews with Nixon in "Frost/Nixon," presented by TheatreWorks Silicon Valley at the Mountain View Center for the Performing Arts January 16 through February 10. 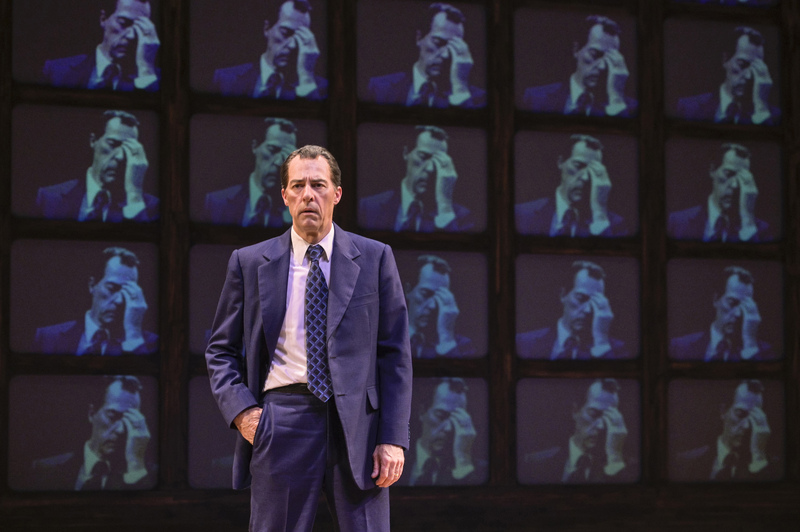 Richard Nixon (Allen McCullough) reacts to his interviews with Frost in "Frost/Nixon," presented by TheatreWorks Silicon Valley at the Mountain View Center for the Performing Arts January 16 through February 10. 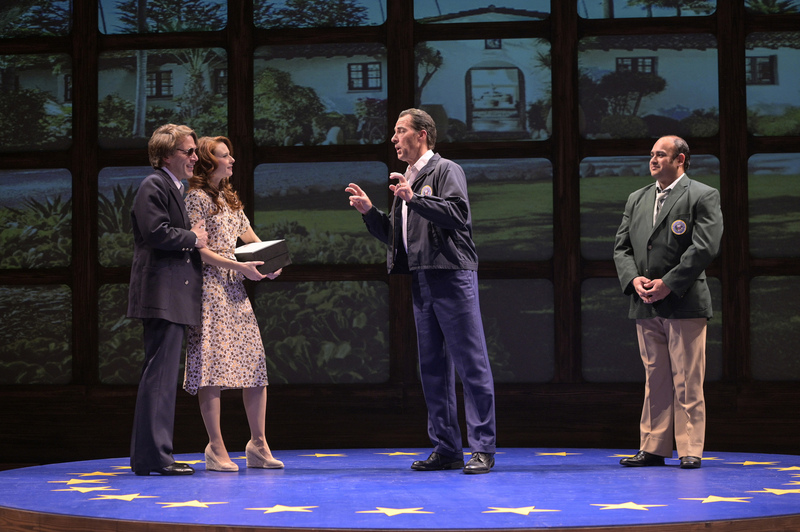 (l to r): Swifty Lazar (Patrick Russell), Richard Nixon (Allen McCullough), Jack Brennan (Craig Marker), Caroline Cushing (Elena Wright), and David Frost (Jeremy Webb) meet in "Frost/Nixon," presented by TheatreWorks Silicon Valley at the Mountain View Center for the Performing Arts January 16 through February 10. 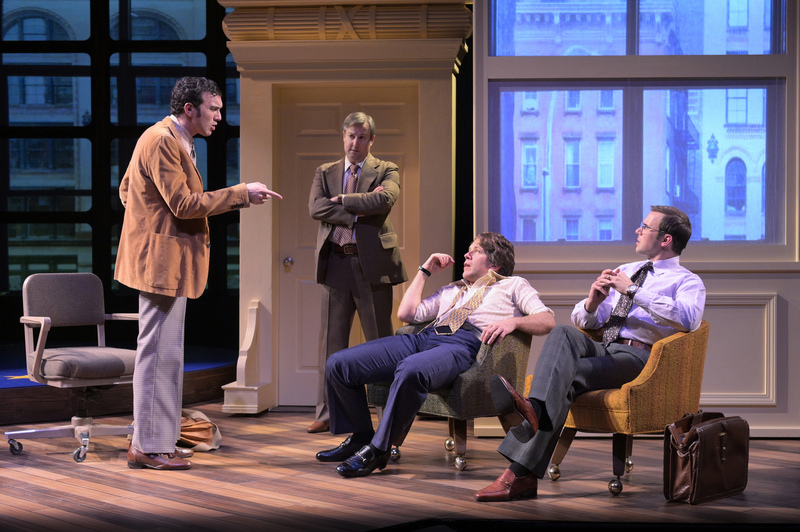 (l to r): Jim Reston (Kenny Toll), Bob Zelnick (Stephen Muterspaugh), David Frost (Jeremy Webb), and John Birt (Adam Shonkwiler) talk strategy for the upcoming interview with Nixon in "Frost/Nixon," presented by TheatreWorks Silicon Valley at the Mountain View Center for the Performing Arts January 16 through February 10. 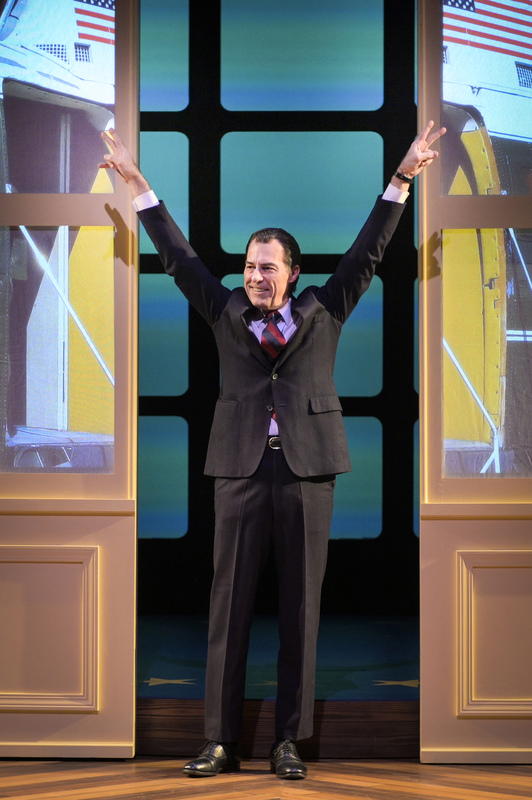 Richard Nixon (Allen McCullough) gives his signature V sign as he leaves the White House by helicopter in "Frost/Nixon," presented by TheatreWorks Silicon Valley at the Mountain View Center for the Performing Arts January 16 through February 10. 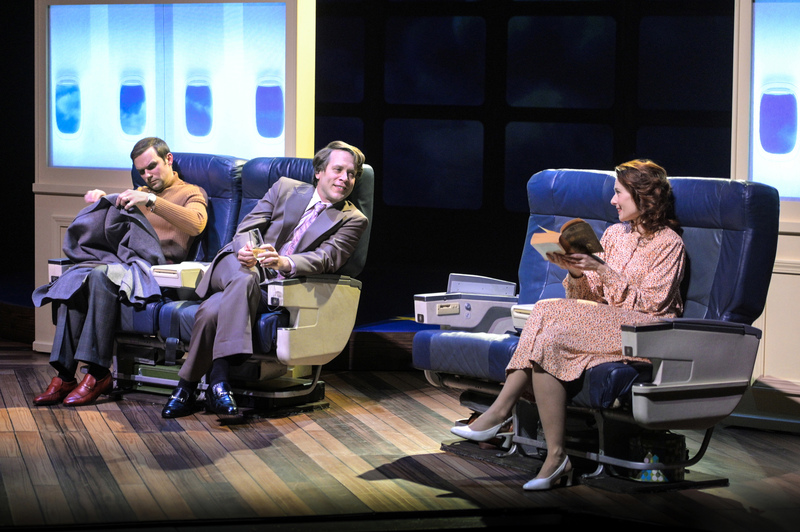 (l to r): John Birt (Adam Shonkwiler) and David Frost (Jeremy Webb) take a plane, where they meet Caroline Cushing (Elena Wright) in "Frost/Nixon," presented by TheatreWorks Silicon Valley at the Mountain View Center for the Performing Arts January 16 through February 10. 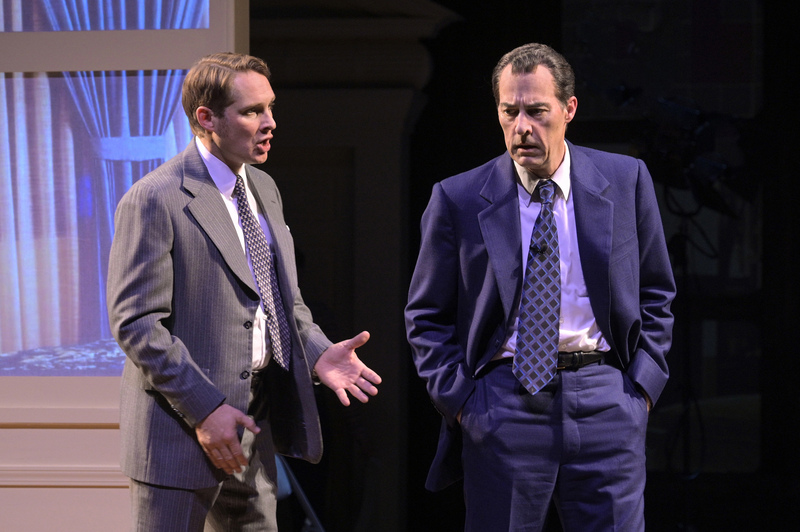 (l to r): Jack Brennan (Craig Marker) counsels an embattled Richard Nixon (Allen McCullough) in "Frost/Nixon," presented by TheatreWorks Silicon Valley at the Mountain View Center for the Performing Arts January 16 through February 10. 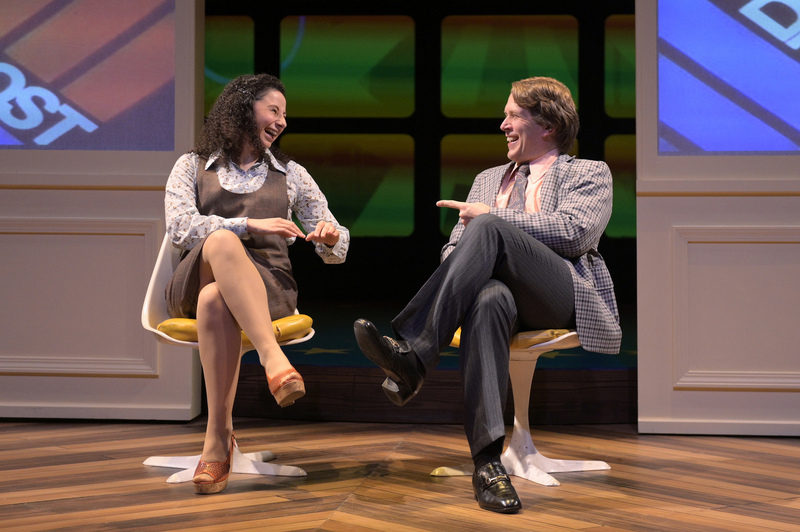 Evonne Goolagong (Alicia Piemme Nelson) is interviewed by David Frost on his talk show in "Frost/Nixon," presented by TheatreWorks Silicon Valley at the Mountain View Center for the Performing Arts January 16 through February 10. 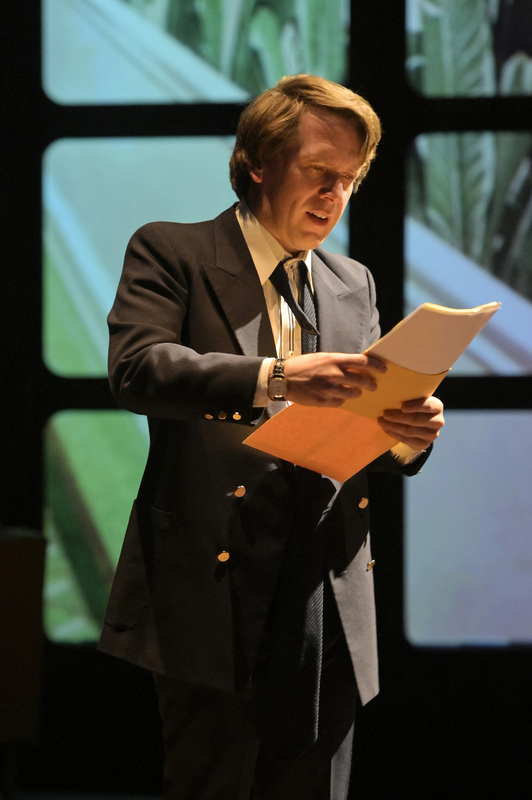 David Frost (Jeremy Webb) views White House transcripts that will change the outcome of the interviews in "Frost/Nixon," presented by TheatreWorks Silicon Valley at the Mountain View Center for the Performing Arts January 16 through February 10. 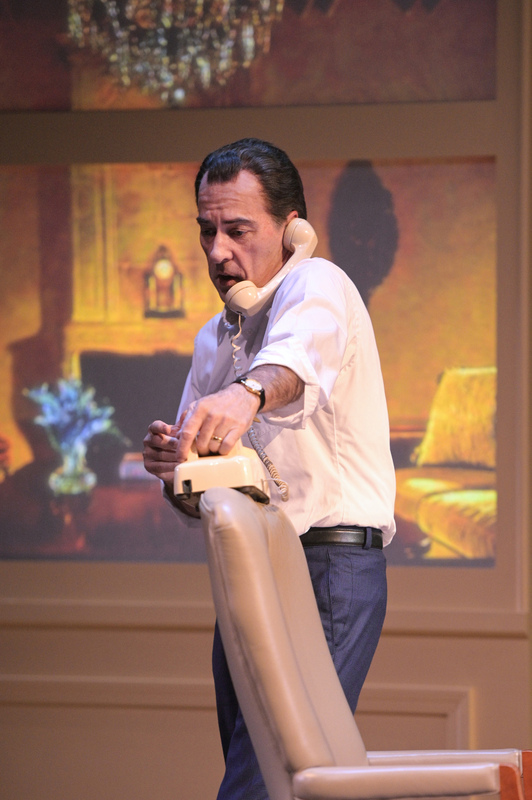 Richard Nixon (Allen McCullough) makes a late night phone call to Frost in "Frost/Nixon," presented by TheatreWorks Silicon Valley at the Mountain View Center for the Performing Arts January 16 through February 10. 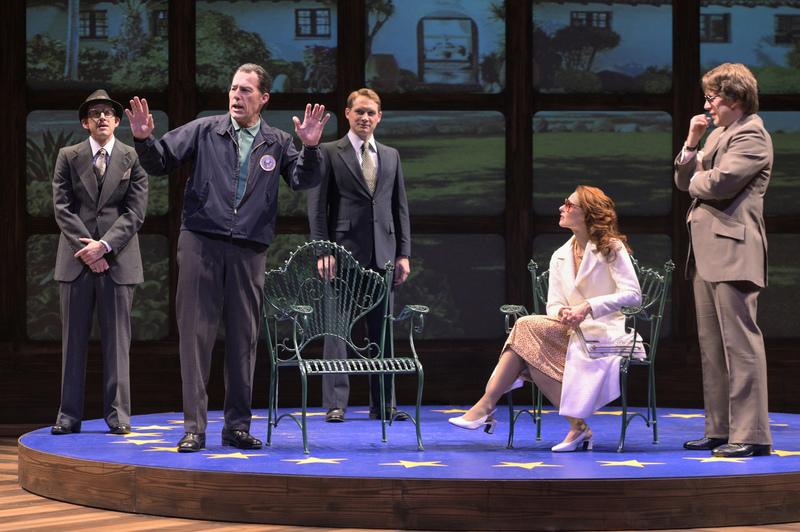 (l to r): David Frost (Jeremy Webb), Caroline Cushing (Elena Wright), Richard Nixon (Allen McCullough), and Manolo Sanchez (Adam J. Saucedo) say goodbye after the interviews in "Frost/Nixon," presented by TheatreWorks Silicon Valley at the Mountain View Center for the Performing Arts January 16 through February 10.